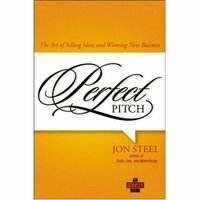 Went to see Jon Steel yesterday to interview him about Perfect Pitch and other things. What a decent, self-effacing, funny, insightful, interesting man. He's my model of what a planner should be. We ended up chatting for just over an hour, and I thought I'd put it all up and not bother editing (because a) I'm lazy and b) I think he's that interesting). The book is well worth reading, as Gareth has noted. Thank you Jon. Thanks for posting the interview with Jon Steel. Brilliant to have open access to conversations about important things between genuinely interesting people - and served without hyperbole. Very refreshing. Thank you, both of you, for this refreshing conversation. Interesting for young planner like me. It’s perfect for a Friday. Thanks so much for this. Jon Steel is incredible. When JWT first hired me, I wrote an e-mail to him mentioning that I was excited about being a planner with a WPP company partially because of his role (but mainly just to have a job). He warmly replied to my e-mail within an hour, and then again to my reply. I was astonished. Jon is another one I would add to that list. Great interview. The only thing that was missing was the clink of tea cups and the munching of scones. Or had you already done that? Nothing better than drinking coffee on a Saturday morning while listening to a conversation between interesting people I know and like. Cheers to the leaders of our profession! Thank you for this, R. Jon proved to be a very inspirational speaker. Having seen this book being bandied around on the blogs, i wasn;t too sure whether it was just hype - but this mp3 made me realise that the book is a must-by, even if you're not involved in The Pitch. One quick criticism, there was a comment about Media - and the creativity that they bring to advertising. I would argue that the rise of Urban Spam is partly due to media - planners 'getting creative' without the skills and understanding of the advertising creative mind. It was encouraging to hear about the WPP Fellowship scheme and the rejection letters; perhaps I should keep some of mine. I think the Perfect Pitch sounds like a must read. jon sounds like such a lovely person. sharp and wise and without any of the egotism or impoliteness that bedevils the industry. This is a great interview, very helpful for me as I prepare for my interview for the WPP Marketing Fellowship! Jon came to talk at MindShare where I worked recently and he was an inspirational speaker, a very dry and sharp sense of humour. D'oh! slightly regretting posting that, other prospective fellows keep emailing me about it! Oh well, share the love and all that I guess. Hi Russell, I'd like to listen to your interview, but apparently the link to the mp3 file is not working anymore. Thanks. Sorry Wim, hipcast seem to have closed my account. Am trying to sort it out.